The Kong Off 3 is Set! 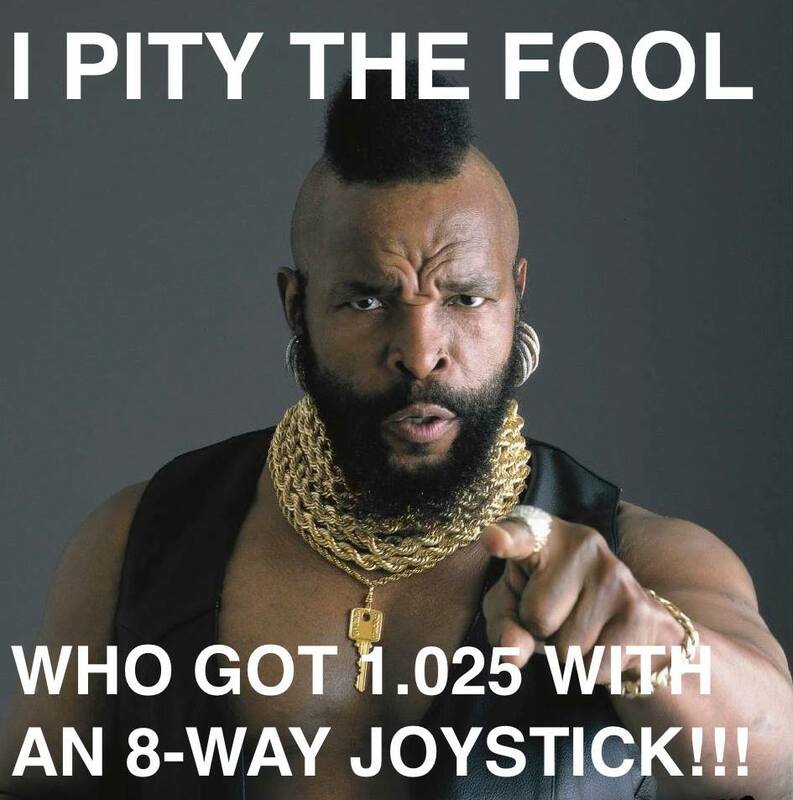 November 11th, 2013 - The October 25th deadline to crack the Twin Galaxies Top 12 has come and gone, and the three Wildcard Qualifier tournaments are in the books. 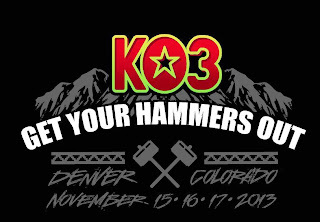 After months of spirited action, 22 players—12 for coveted "dedicated machine" honors, and 10 online pre-qualifiers for the Wildcard Division (who will play on shared machines)—are headed for Denver and their chance at a share of the Kong Off 3 prize purse of over $5,000. The battle begins in just four days. Since the Kong Off 2, one year ago, the Top 12 has changed significantly. Vincent Lemay's near-miss at the world record in January put him in 2nd, then Mike Groesbeck jumped into 9th in June with 1,023,600, followed closely by Robbie Lakeman, who claimed 10th in July with 1,021,100. Both Groesbeck and Lakeman, however, would almost immediately slip two spots to 11th and 12th and into the "danger zone", when Steve Wiltshire upgraded his personal best to 1,058,200 (placing him just below Billy Mitchell), followed by Top 12 newcomer Jeff Wolfe with 1,054,900 in September. These moves pushed former Kong Off main-eventers Dave McCrary and Kyle Goewert out of the Top 12. McCrary put up a valiant effort right until the qualification deadline (including one very painful close call of a game that was on pace to cross the "Wiebe/Mitchell Line"), but ultimately could not improve his score. 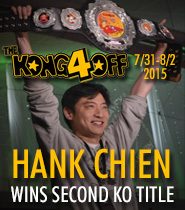 He and Goewert will compete in the Wildcard Division at the Kong Off 3. Robbie Lakeman, who Donkey Blog profiled in August after his then 10th-place Funspot performance of 1,021,100, soon found himself hovering precariously in 12th position after Wiltshire and Wolfe's new scores. Then, on September 27th, Ross Benziger dropped a bomb on the scoreboard, almost breaking the world record, taking second position, and bumping everyone but Hank down a spot. Now Lakeman was in 13th place and out of the main lineup. He had just under a month to overtake Groesbeck. On October 21st, four days from the qualification deadline, after a month of attempts, and in the midst of a cross-country move, Lakeman visited the home of Kong Off 2 Wildcard Division champion Eric Tessler for a live-streamed 12th place attempt. Hours later, and after "the hardest game of [his] life," Lakeman found himself having beaten Groesbeck, just barely, with 1,025,900. But celebration quickly turned to horror as the hardware verification began. 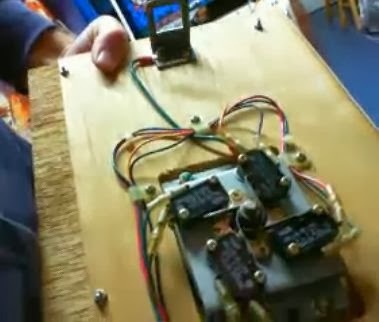 After unlatching the control panel and displaying the underside for the camera, Twin Galaxies referee Ken House, on hand for the stream, made the dreaded pronouncement: "that's not a Nintendo joystick." Under Twin Galaxies rules, no Donkey Kong score can be accepted without a standard-issue stick with a 4-way restrictor plate, and the one on Tessler's machine wasn't going to pass muster. "I have played on 10 machines in 6 different states in the past month. I've battled through hours of fatigue and finished one of the most difficult games of my life after a 5 hour drive. I have done everything I could and played so well it's frustrating the fact I still might not have a Kong Off spot after everything I've been through lately... there's just some strange mysterious force around me that prevents me from having a Kong Off spot." After a control panel replacement, Lakeman kept at it undaunted. 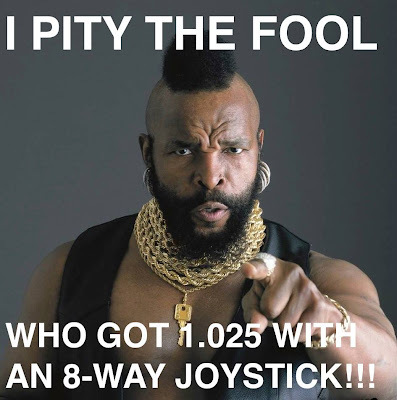 Then, on October 23rd, just 48 hours after achieving his disqualified score, and 48 hours before the qualification deadline, Lakeman scored 1,025,300, beating Groesbeck once again with almost the exact same score he'd achieved two days before... but this time with the right joystick. 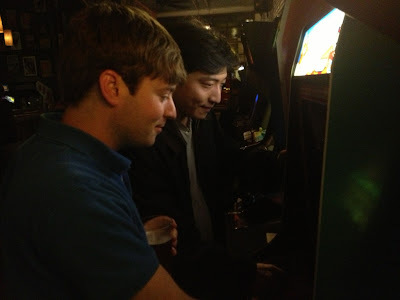 Lakeman wrote an article for Twin Galaxies (which I highly recommend) detailing his journey to the Kong Off, during which he went "through hell and back in both Donkey Kong and life in general." As Twin Galaxies representatives made a final "roll call" for Kong Off 3 contestants, Mark Kiehl caused a stir when it was made known that he would not be attending the tournament, thereby surrendering his Top 12 position. This came as welcome relief to Mike Groesbeck, who endured his own roller-coaster ride. First he achieved a 9th place score, was then bumped down three spots to 12th, "bubbled" into 13th by Lakeman just before the deadline, un-bubbled by Twin Galaxies' disqualification of Lakeman's score the next day, bubbled again by Lakeman two days later, then finally un-bubbled by default upon Kiehl's departure from the field! Twin Galaxies officially introduced the Top 12 on October 31st. Phil Tudose, the talented Canadian player who emerged as the top seed in the wildcard field (and more than good enough for Top 12 status, but ineligible since he plays on MAME and not original arcade hardware) also elected not to attend the Kong Off 3. How he would have performed, had he been there, will be one of the great "what if"s of the Kong Off 3. Tudose has, moreover, announced his retirement from Donkey Kong altogether, now satisfied with his achievements in the game and ready to move onto other things. We will miss you, Phil. 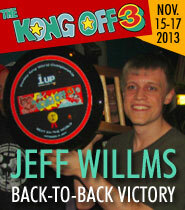 On October 30th, already safely moored in the Top 12, Jeff Wolfe put a final cherry on top of the pre-Kong Off action by becoming the fifth player in history to cross 1.1 million points on a Donkey Kong arcade machine. Wolfe's score is not official yet, but along with his recent attainment of the "no hammer" world record, he has cemented himself as one of the absolute elite, and in serious contention for the Kong Off 3 title. 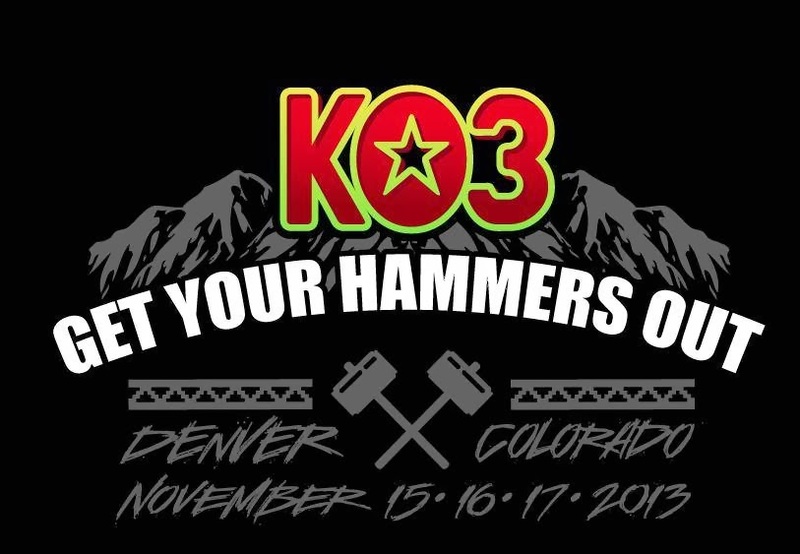 Congratulations to everyone who managed to earn a spot in this year's Kong Off (particularly those who had such a rough go of it), and good luck to those who will play the live qualifier for the Wildcard Division on Friday in Denver. 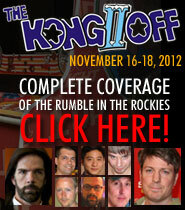 Please visit the Kong Off 3 page for a poster featuring all of the contestants, and to follow along with my coverage from the event. I will be competing in the Wildcard Division this year, and as such, it's hard to predict how much coverage I'll be able to manage, but I'll do my best. KO3 is going to be EPIC. the 1up start the online wild card eh ? I think the doubles game would be a very interesting category. It would be very cool to watch two greats playing together. Sadly, Robbie's TG article is now 404. 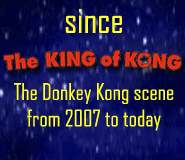 I found it again at https://web.archive.org/web/20131119054453/http://www.twingalaxies.com/article/2448/robbie-lakeman-my-road-to-the-kong-off/ . 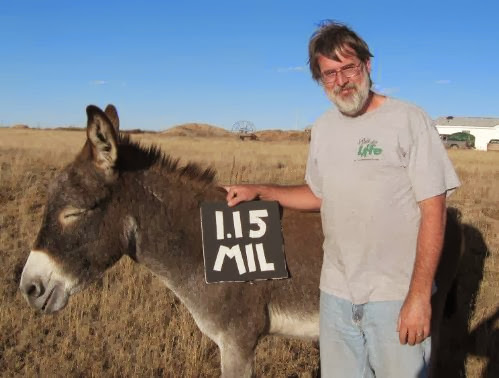 Donkey Blog has ended its run! Enjoy these archives, chronicling major events in DK competition from 2011-2016. Some pages (including The Top 20 Scores) will be updated occasionally, but there will be no more new content. Thanks to the readers for pushing the blog past 1.5 million page views and exceeding all expectations. For the latest in competitive DK, please visit the forum. Wes Copeland: New World Champion! NEW WORLD RECORD! Lakeman Beats Chien For DK Title! KO4 Is On, and Twin Galaxies Is Alive! Robbie Lakeman: "I Feel Like I Could Take On Hank"
Steve Wiebe Coming Back for the Record? !